1. Make as many bows as needed for pews. Attach ivy and either silk or live flowers to bows with florist wire. 2. Drape tulle on each pew allowing 1-1/2 to 2 yards per pew. Attach to pew using rubber bands or florist wire. Note: if using 54" or wider tulle, cut in half lengthwise. 3. 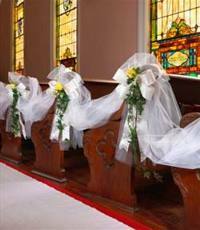 Attach bows and flowers to pews with florist wire. 1. 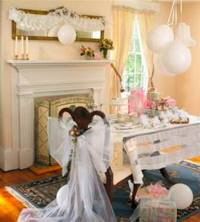 Wrap "guest of honor chair" with tulle (if using 54" or wider tulle, cut in half lengthwise) and tie into bow. 2. Make bow with ribbon and add flowers and ivy. Attach bow to chair with florist wire. 3. Use additional tulle to wrap presents or a centerpiece. Tulle can also be added to gift bags as fillers, or cut tulle into circles or squares and wrap favors. 1. 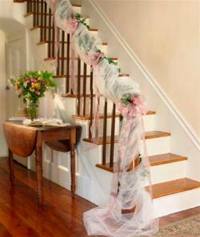 Loosely drape tulle around staircase banister, starting at top and ending in a flowing "pool" of tulle at the bottom. 2. Make bows with flowers and ivy and attach to banister spaced evenly along entire length.